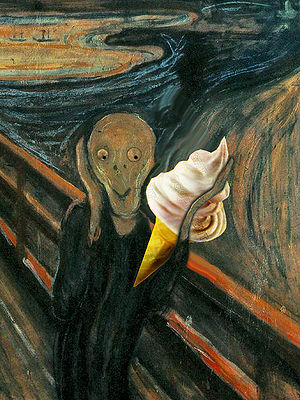 The Ice Cream - from Munch's earlier, happier period. 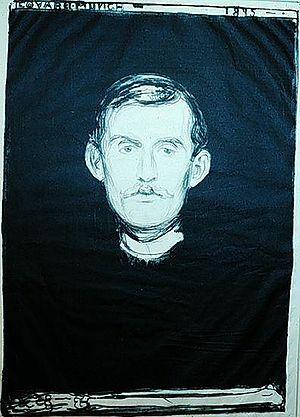 Edvard Munch (pronounced "mŭnch", to rhyme with "lunch") (1830-1939) was an artist, painter, lover and lapdancer born in Oslo, Norway, who lived to the age of 109. He is noted for his particular skill in getting his paintings nicked. No other artist has had so many works stolen from beyond the grave as Mr. Munch. They walk out of galleries all over the Mississippi Delta , often turning up in jumble sales and rubbish bins and handed back to the galleries, only to to be stolen all over again a few weeks later. Munch worked in the Expressionist Idiom, which is a coffee bar in the suburbs of Oslo. His excessive consumption of coffee led to his expressionist manner of furiously dashing off a painting on the back of a cereal packet in under thirty minutes and then punching a hole through it with his fist. Modern Norwegians all over the world look at him as their god and honour him each and every day before breakfast by hammering their brains out of their head with a hammer onto a fresh, white tablecloth, previously innocent of human blood. Born to his parents (something of a shock in Norway at the time) Mr & Mrs Aardvark Munch, Edvard was a happy and well adjusted child who liked ice cream and pulverising frogs with large rocks. His parents had hopes that their little munchkin would grow up to become a dental consultant, maybe even one of the senior consultants in Thronso, but Edvard preferred to lead the dreamy, selfish, loafish, egocentric and clueless life of the artist, so they took him to a forest and left him there, in a small cave. It was during this time that he painted his first major work, The Ice Cream, a simple paean to a young Norwegian and his love of ice cream. This was swiftly followed by Man Pulverising a Frog with a Large Rock, a graphic reminder of the fragility of amphibians. These works became known as his "early cave paintings," and are highly ignored by art dealers everywhere. Munch's happy idyll was all to change, however, when he came back to his cave one day and discovered that it had been stolen. It was his favourite cave, too. Munch sat on a large Norwegian mushroom and was overwhelmed by the cathartic revelation that everything in the world is profoundly nickable. From this moment on, he was miserable. Typical party at Munch's place. In the late 1800's, Munch took an apartment in Oslo. He didn't get very far with it, though, because the horse collapsed from the strain and it jammed up the high street. Munch was arrested and thrown into solitary confinement - a period of his life which he later stated was the happiest. Upon his release from prison, he became something of a socialite, throwing large parties where friends and associates could come and discuss misery, sickness, and death. Cheesy nibbles and Fanta were completely forbidden, and everyone had to wear black sackcloth, or preferably just sacks. Sometimes as many as three or even seven people would come to these parties all at once, completely filling up the small attic room that Munch lived in. 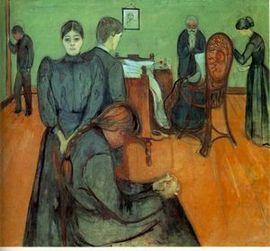 It was during this time that Munch painted The Screech, The Yelp, The "Oi!," The Slap-Happy Norwegian Grappler, and The Sad Little Puppy Trying To Find Its Way Home In A Snowstorm Only To Be Crushed Under The Weight Of A Falling Piano - Because God Laughs At Puppies Too. After this, Munch got really miserable. Edvard spent his later years looking forward to death with sheer terror while curled up in a corner of his room, under a sheet. He did manage to do some paintings before he died, futilely, of an unusually aggressive nail tumour, in the absolutely pointless late 1930s. The Doc Says I've Got Cancer. But I Reckon It's Armless - one of Munch's later "joke" paintings. Although late, they have no excuse. They were intended by Munch as a poignant insult to past lovers - just to show them. Today they are highly sought-after by art collectors in Uzbekistan, who strongly deny that this is because Munch painted them all in plutonium, with a watercolor overlay - so that anyone who touched them would get cancer and realise that life is unfair. Is That An Imploded Lung Or Are You Just Pleased To See Me?